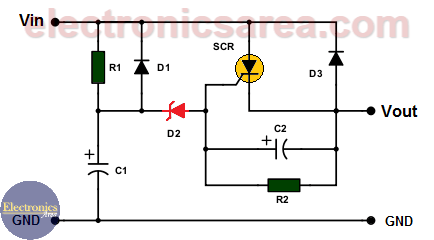 This Surge protection circuit is placed between the DC voltage source and the circuit that you want to power. 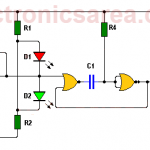 This circuit delays the voltage given by the power source and allows the voltage to be applied to the circuit or device a few moments later. 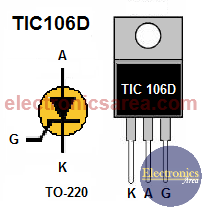 The circuit is also useful to prevent a peak voltage from reaching the circuit to be powered. We turn on the switch of the power supply or when we plug in an electronic device connected to our voltage source. Electric power returns after a power outages. Sometimes the voltage is higher than normal. Another possible application is to prevent two or more circuits from being power-On simultaneously. It is necessary to clarify that the delay that can be obtained with this circuit is small and it is not exact. Formula for the delay time is approximately T = R1 x C1. (R in Ohms and C in Farads). A longer time is achieved with a larger electrolytic capacitor (C1). How does the surge protection circuit (voltage delay circuit) works? When the voltage of the power supply is applied to the input “In” (Vin), it does not pass immediately to the output terminal (Vout), because the diode D2, which is polarized in reverse, does not allow the passage of the current to the load. The current starts its passage through the RC circuit (R1 and C1). 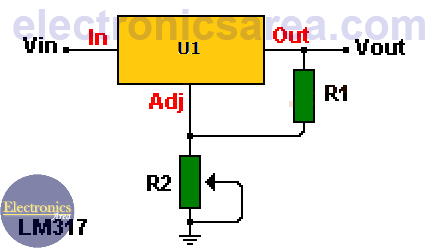 Capacitor C1 begins to charge and the voltage at its positive terminal increases. When the capacitor voltage is equal to the sum of the zener diode voltage and the thyristor’s trigger voltage, the SCR go into conduction and allows the passage of current from the “in” terminal to the “out” terminal. The voltage of the zener diode must be half the voltage of the input (vin), and the amount of current that this circuit allows to pass depends on the type of thyristor that is chosen. Using the SCR of the diagram, the current is 5 amps. Resistor R2 and capacitor C2 prevent false triggering of the SCR. C1 and C2 voltages depends on the power source. A safe value could be 50 volts or more.